"You persuade me to tell you why the "overture" in ASM. In planning the book I didn't want it to be an autobiography ("I was born . . ."); it was to be the story of us. "We met angrily . . ." was the true beginning. But I wanted to set the stage in advance, especially Glenmerle where so much of our love developed. I didn't want to be writing about our going together to Glenmerle and then having to take a couple of pages to describe Glenmerle. Moreover, there were a few things in my early life that played a role in the development of our love, e.g., what my room looked like, my 3-part boyhood code & several other things. How to do it? Then one morning before my eyes were open (literally) I saw how to do it: the walk into Glenmerle, with all its memories of the past. But if I began with that, setting the stage, remembering boyhood, I would have to tell of her death and being in the wind. I didn't particularly want to tell there of her death and other hints of the future, but I saw no reason not to . . . and the 'overture' idea developed. The point I wish to stress is, I wanted to describe Glenmerle (and a few bits of boyhood memories) before we went there together. The tip-off to her death and to the great love was not the reason for the chapter: I merely saw no reason to conceal them. So its sounding like a modern novel was, so to speak, an accident." How did the prologue strike you? Did it draw you into the book, or lose you? What important themes are introduced here? Judging by the clues in "The Shining Barrier" chapter where would you guess Sheldon Vanauken was born and raised? Do you think Van and Davy's "shining barrier" was an admirable realization of the biblical principle of "one flesh" marriage, or was it too "us-centered", or somewhere in between? How do you think young people might react to this chapter versus the perspective of a person who has been married for many years? What events in "The Shadow of a Tree" chapter prepare the way for Van and Davy's "encounter with light"? How did you react to Van's recounting of "the cold sea fire" in this chapter? What other experiences of beauty expressed in this book did you find especially moving, if any? What did you think of Van's description of Oxford? Did his description make you want to go there? Do you think Van's Oxford still exists? Did it ever? What moved Van and Davy to the point of conversion? What important steps guided Van and Davy's developing relationship with Jesus Christ as expressed in the chapter: "Thou Art the King of Glory"? 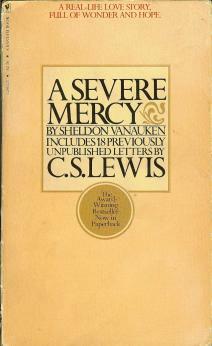 How did you like Van's description of C. S. Lewis and their growing relationship? How does the opening sentence of chapter 6 prepare us for the changes coming in this story? Compare and contrast Van and Davy's experience of the church in Oxford versus Lynchburg. What important steps did Van and Davy take to keep their Christian faith alive and to pass it on? How was "the shining barrier" breached? Do you think this was a good thing? Was it inevitable? How did you respond to Van's description of Davy's suffering and death? What did you think of the way Davy handled her own suffering and approaching death? How about the way Van handled it? What did you think of the way Van handled the grieving process? Was it admirable? Too obsessive? Do you think "a severe mercy" is an appropriate term applied to Davy's death, or anyone's death for that matter? Does this make God into some sort of cosmic sadist? Or do you think there is an appropriate deep mystery and meaning evoked by this phrase? What did you think of "The Second Death" chapter? If you are willing to share: have you experienced a similar sense of closeness to a loved one who has died, followed by a cessation of that sense of their presence? If you have not personally experienced this, do you know of others who have? What did you think of the poetry throughout the book? How does the poetry weave the entire story together? Would the book be as moving or complete without the poetry? Which poem, if any, was your favorite? What did you think of the C. S. Lewis letters throughout this book? Do you think the Lewis letters are merely a way of selling the book? Or does the book stand on its own? A Severe Mercy, having sold over two million copies, has been admired by readers for three general reasons: (1) the love story, (2) the conversion story, or (3) the story of grief. Which part of the story did you find most appealing? Why?